What can we learn about the behavior, habits, and needs of wildlife of the Mongolian steppe? Explore the lives of grassland animals, from the hedgehog to the Siberian ibex, to help conserve their wilderness home. Your team will enjoy an extraordinary perspective of the desert and steppe environment in Central Asia, as well as visits with local herders for a unique cultural experience. Working alongside Earthwatch scientists, you’ll study a diversity of grassland animals: big animals such as argali sheep, Siberian ibex, and cinereous vultures (the largest raptors in Eurasia), smaller creatures like the globally threatened lesser kestrel and two species of hedgehog, and prey species from lizards to steppe rat snakes to leaping jerboas. Volunteers who prefer not to work with the snakes will have plenty of other ways to keep busy on other aspects of the research. In your recreational time, you’ll be free to explore this wilderness landscape in a way few people ever can, and you’ll also have the opportunity to experience Mongolian culture in the capital city of Ulaanbaatar. This project requires a reasonably good fitness level due to its active nature and the remoteness of the location, and familiarity with hiking and camping. This magnificent region of semiarid grasslands and rocky outcrops is one of the best hopes for wildlife in central Asia. Careful stewardship is required to protect and conserve habitats and the many mammals, birds, and reptiles that depend upon them. Mongolia hosts a rich diversity of wildlife, especially compared with other Central Asian nations. Ikh Nart Nature Reserve, with 666 square kilometers (257 square miles) of grassland and arid steppe habitats, provides a protected home for many of its species. But even within the bounds of the reserve, the animals of Ikh Nart face threats from poaching, illegal mining, and overgrazing. Local counties manage protected areas for the Mongolian federal government, but they lack the resources to provide active stewardship. Few people get the opportunity to view Mongolia’s wildlife, because many species remain very shy and inhabit inaccessible areas. This magnificent region of semiarid grasslands and rocky outcrops is one of the best hopes for wildlife in central Asia. Argali sheep, lesser kestrels, cinereous vultures, and other animals threatened throughout their range find a stronghold here. Herds of graceful Mongolian gazelles and goitered gazelles roam freely through the reserve. For the past several years, Earthwatch teams have worked to study and conserve the area's wildlife, including the "near-threatened" argali—the largest mountain sheep in the world, with huge, curling horns. Their efforts have been so successful that results from the work have been used to develop improved conservation management policies in the reserve, and the research team has expanded their studies to include several other species. Ikh Nart is a high upland region covered by shrubs, scrub vegetation, and turfy grasses. The wildlife includes argali sheep, Siberian ibex, cinereous vulture, lesser kestrel, hedgehogs, and many other species of mammals, birds, and reptiles. Mongolia remains largely undeveloped, with few paved roads. Most people outside the cities still live a nomadic existence. People in the countryside live in gers (yurts) and wear traditional clothing. If you visit Ulaanbaatar before or after your expedition, you can see the Winter Palace of Bogd Khan Museum, the Manzushir Monastery Museum, the Gandan Monastery, Sukhbaatar Square, or a performance by a traditional symphony or the Mongolian circus. Radio-track wildlife. The researchers have already radio-collared some argali sheep, ibex, hedgehogs, Pallas’s colubers (a type of snake), and kestrels. You'll collect radio-telemetry data from these animals, which allows researchers to track their location. You'll also put radio tracking devices on animals that don't yet have them. Capture argali and ibex in nets. The September team will help herd these animals into nets, then help collect data on them and safely release them. Hike to survey vegetation. Measure and identify plants in research plots throughout the reserve. Hike to survey argali sheep and/or lizards. Some groups of volunteers will walk along set paths to spot lizards or argali sheep, then record the animal's behavior and location. Track vultures and kestrels. In the summer, volunteers will look for the nests of these birds of prey, then note their GPS locations and measure the nestlings. You'll hike four to six miles a day, accompanied by members of the project’s large, friendly team of Mongolian experts and students. You'll also get to visit nomadic families and see the traditional Mongolian lifestyle firsthand. Vegetation sampling in measured plots. Volunteers may help to collect data on cinereous vultures. Gana Wingard holds master’s degrees in both environmental science and wildlife ecology, and has studied argali and domestic livestock feeding relationships at Ikh Nart. Gana's a Mongolian national with experience leading ecotours, and a resident of Denver, Colorado. You’ll stay in Zaya’s Guesthouse in Ulaanbaatar, comfortable accommodations with en suite bathrooms and apartment-style housing. The guesthouse offers breakfast and has free Internet access, provides transport to and from the airport, and can help arrange excursions before or after the expedition. Zaya’s is in the heart of Ulaanbaatar, within easy walking distance of tourist sites, restaurants, banks, and shopping. In the research area, you’ll stay in tents or traditional Mongolian gers (yurts). A cook will prepare most of your meals. We’ll generally eat breakfast and dinner together, and you’ll make your own lunch to carry into the field and eat later. In addition to Western food options, you’ll have a chance to try traditional Mongolian baked goods and evening meals, airag (fermented mare’s milk), and Mongolian barbeque. This expedition will take you to a corner of the world that most visitors to Mongolia never see. Because of the remote location, it's nearly impossible to accommodate restrictive special diets. Please contact an Earthwatch representative if you have questions or concerns. This was my first Earthwatch experience, and the bar is now set high for any subsequent expeditions! The time spent in Mongolia was interesting, educational, and enjoyable. Especially meaningful was the opportunity to work as part of a team that included – in addition to the other volunteers – Mongolian graduate students, rangers, veterinarians, drivers, “horsemen” (some on motorcycles), and camp staff. All exuded warmth, good nature and a sense of humor while collectively providing unique insight into Mongolian culture. It was rewarding to take part in the research being directed by Gana, who also played a major role in setting the upbeat and congenial tone at the site while at the same time keeping all of us on task. I came away with a new appreciation of the vast landscape and its people as well as for the work being done at Ikh Nart. If you are interested in engaging in the research, are eager to experience firsthand a slice of life in this interesting country, and are willing to be flexible (weather and wild critters may dictate your days), by all means, sign up for this expedition and head to Mongolia! 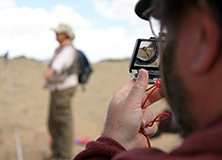 Earthwatch Mongolia is a once in a lifetime experience not to be missed. You get fully immersed into the Mongolian culture while doing excellent scientific work. It is a very tight- knit team of volunteers, scientists, veterinarians, students, and support staff. A true joint venture mostly made up of Mongolians. The leader, Gana Wingard, along with her Mongolian partner, Tuguldur Enkhtsetseg, does an excellent job running a large enterprise, and is very concerned about the welfare of the volunteers. The actual science work is not to be missed. Our team caught wild gazelles in nets and helped the veterinarians take blood samples and put on radio collars. We could see the first data before we left. 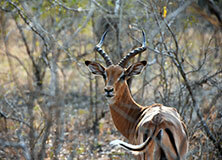 This data is important to characterize the range and necessary protected zones for the gazelles and other animals. We also saw, up close and personal, the very friendly Mongolian people, both those living in towns and those living as nomadic herders. You will be fully engaged in the field work working with dedicated local researchers and local university students. The enthusiasm of the locals is infectious and rewarding. Mongolians are friendly and known for their warm hospitality. Chief scientist Gana has dedicated her life for conservation and community activism. Mongolia is a beautiful country with stunning landscapes and sunsets. Local community involvement and the rewards can be seen and experienced. This Project challenged me to utilize and exercise my potentials and life skills. I came away from the expedition so much more richer in knowledge, experience and friendships. It underscored our commonality in sharing this earth and our responsibility in helping each other to watch over it. Thank you for this unique and priceless experience! I loved exploring the fascinating and harsh environment of the Gobi with a passionate and enthusiastic Mongolian research team. This project is working with Mongolian students and is also supported by the Denver Zoo to do important research on essential species that reside in the Gobi. The research topics are broad so you have the opportunity to collect several types of research data - vultures, bats, snake, lizards, rodents (some I would have never imagined! ), argali sheep and ibex were all topics of focus. The different topics add diversity as well as allow for versatility when needed - be flexible, sometime you have to adapt to a blown tire or a weather extreme. Research data in these remote and difficult environments is so essential and so is supporting and inspiring local young people to further their careers in science and conservation - both of which make this expedition so rewarding. We had the opportunity to learn about the local cultures, traditions, some archaeology, and dancing at the disco (no kidding - it was so much fun). The research team is an amazing group of people and we had a fantastic time learning from each other, working together, and enjoying each others company. After an amazing experience on my first Earthwatch expedition in Nicaragua I decided that I would like to join another trip and reviewed my options, settling on Wildlife of the Mongolia Steppe. As it was my second Earthwatch trip I knew that I was going to be well taken care off, so I packed my bags and arrived at Ulaanbataar airport ready to meet the rest of the team. Although my expedition this year had fewer volunteers than my previous expedition, it turned out to be great for us as we had many more staff on the trip from Denver Zoo which meant we had more people to share their knowledge with us. All the staff were extremely friendly, knowledgeable, passionate about their work and generally just great fun. We were immediately made to feel part of the team and any questions, suggestions, ideas, concerns we may have had were listened to with respect. It was also great to have so many local students on the trip, it was really special to be able to work with them as they understand the environment so well and really looked after us during the field work. I felt extremely safe with them and learnt so much from them about the Mongolian Steppe and its wildlife as well as learning about their culture, who doesn’t enjoy a bit of Mongolian rap music! Ihk Nart camp was a very special place to be, from a practical point of view it is a very well-equipped camp and the gers were really comfortable, and as for the food, delicious! Being able to spend so much time in such a remote, yet beautiful environment was something I’ll never forget, it is truly a spectacular place to be. On arrival, we were well briefed on camp life and all the field work, taken through the different studies which we were able to help the students with. There was a wide variety of studies going on, you could easily assist with three different projects a day if you wanted to and the team tried to ensure that each volunteer had a chance to help out on every project at least once. The support team in camp were also excellent, the drivers, cook, cleaner and camp manager all made our stay enjoyable, all so helpful and approachable if you had any issues. The main projects we helped on were vegetation, small mammals, vultures, kestrels, Argali sheep and pika (a small furry animal) tracking and monitoring as part of many long term studies. Sometimes this would involve a hike and other times a nice drive in an air-conditioned 4x4. Whichever way you got to the animals, you got to experience the vast beauty of the steppe and enjoy the wildlife in their natural habitat in all their glory. The trip has certainly given me a new love for vultures, they are a much misunderstood bird and yet so amazing, it was a joy to watch them in the wild. In addition to the wildlife monitoring, we also built stone dams to help with water conservation in the camp environment. This was something that wasn’t in the briefing and although a bit strenuous in the heat, it was something which really made you feel that you could actually make a difference to the environment. Something which I hope will be part of future expeditions there as it felt like really valuable work. Of course there was also plenty of time for other activities, we had many interesting talks from the academic staff about the studies and why our contribution was important, giving us a great understanding of the aims of Ihk Nart and how it has developed over the years. We also had some entertainment from the students such as impromptu wrestling tournaments and dance lessons at the weekly disco. Other activities were also organised for us such as a visit from some local women to demonstrate their felt making skills and a visit to a traditional ger and we travelled to the camp via the Trans Mongolian Railway which was an experience itself. The expedition exceeded my expectations, the organisation was excellent, the location was spectacular, the work was interesting and varied and the staff and students were so welcoming and friendly, altogether an amazing experience. I went on the leg of the expedition that went to Toson Hulstai instead of Ikh Nart. It is very remote and the Toson Hulstai camp is less established as it is much more recently created. However Tuugii, Gana, and all the Mongolian students will make you feel very welcome! The food is absolutely excellent; our cook made really quite varied and magnificent meals every day. The work was very fast paced, especially the first week there was really very little downtime, so be prepared to work and be out in the field all day! Once we successfully radiocollared all the gazelle we were able to slow down a bit and focus on other parts of the study, like bird watching and counting. The landscape is much different then what you might see at the other study site; grassland as far as you can see. Absolutely stunning all around! Wonderful steppes, vast, open scenery, views for miles and extraordinary animals. Imagine Mongolian horsemen thundering down the canyons, herding wild Argali sheep, ibexes or Mongolian gazelles into our nets, which we set up for a quarter mile. Once captured, the animals are blindfolded to calm them, measured, ear-tagged, fitted with radio collars, examined, weighed (if they can be held that long!) and then released. It is a rare opportunity to see a large mammal project so close. The outpost is remote, with no running water, so be prepared to rough it. But the food was excellent, with a team in the kitchen cooking four styles of cuisine--vegetarian, vegan, lean meat for Americans and greasy meat for locals. The best is Gana, the Principal Investigator, who commands her organization like a general on the field! And Kevin the Vet, with stories of the Rolling Stones, capturing vultures and fitting snakes with transmitters. And all the park rangers, students, herdsman, motorcylists, horseman and even a contingency from the Denver Zoo. It was quite a gathering! The "Wildlife of Mongolia" expedition is one not to be missed. Breathtaking scenery is coupled with vital field work as volunteers help researchers develop a more comprehensive picture of this extraordinary ecosystem. Whether helping capture and radio collar endangered Argali sheep (the largest native sheep in the world), band Cinereous vulture chicks (the adults have a 10 foot wingspan), trap small mammals, or survey plant populations, the research is varied and exciting. Most of the time you are partnered with dedicated and enthusiastic young Mongolian undergraduate and graduate students who were just wonderful to work with. I will never forget these young people and am so thankful that my efforts are helping to develop this next generation of native Mongolian field researchers. Mongolia has been the most amazing trip I've ever been on and this expedition was exceptionally amazing! Getting to meet amazing people and working with so many passionate people brought with it great satisfaction and many joyful moments. The whole trip was perfectly organised and excellently executed from the first meeting in Ulaanbaatar to the train journey and to camp. The activities and tasks were very manageable and brought a sense of satisfaction and pride of good feeling. The Mongolian students and everyone on this expedition were all magical and couldn't have chosen a better bunch to be with. A beautiful country to visit, a great place to visit at Ikh nart, very beautiful and picturesque for the photography and videography enthusiast like myself. Words can't really express how incredible and life-changing this trip was for me and my fiancée, whom I proposed to at Ikh Nart Nature reserve, (one of my many highlights). Great people, great project, and great cause. You just have to trust your instincts and go on this expedition! On an ending note, another great highlight was getting an argali and ibex named after myself and my fiance. This, and getting engaged on camp gives us another reason to go back!! If you want to pretend you are the head of the Rockefeller Foundation for 10 days you might join the special Earthwatch team that goes to Toson Hulstai, in September. If your experience is half as enjoyable as mine you will be very fortunate. Since I am a photographer with long legs I was giving the front passenger seat on the drives. This expedition is a first class group of many (10) conservation organizations and on this expedition PHD's outnumbered volunteers by a three to one ratio. We had very enjoyable living arrangements. Yes, they are Spartan but you won't mind it. There is nothing like taking a sun shower in a good stiff wind with the tarp flapping. If you like taking time lapse star sequences you have come to a very choice location. The air is really clear. I will never forget the sight of the red moon as it rose the first night we were out in the protected area. The game drive was actually a short distance and we had phenomenal success radio collaring all 10 gazelles. The net setup was done carefully to minimize the stress to the gazelles. It is hard to describe coming over a ridge and seeing thousand of gazelle's running away from you well… it is pretty spectacular. Since we were so successful in our gazelle netting we had a lot of extra days for backup plans. I think we spent two days installing signs at strategic locations near the edges of the park. We also spent two days driving around and looking at endangered species and some archaeological sites. A 150km round trip to see white necked cranes was definitely worth it. The long drop toilet was clean every time I used it, but I have to admit there was a lack of privacy. I have recommended that they upgrade this a little bit. Mongolians just are not as concerned about privacy as most Westerners. Mongolia was truly a unique experience. Certainly one of the best Earthwatch projects I have done. The Mongolian people are lovely and passionate about their country. The national park that we were in, Ikh Nart, was wonderful. There were 6 volunteers and we were really lucky to be at the camp at the same time as the Assistant Curator for Birds at Denver Zoo who was there to try to capture Cinereous vultures. Mary-Jo had 4 radio transmitters that she wanted to attach to the backs of 4 adult vultures. Capture was never going to be easy and I have to say that vultures are wise birds! We spent many hours sitting waiting near nest sites but were not successful. One day we were out for 14 hours. As well as the vultures there is research being done on the Argali sheep, snakes, Lesser Kestrals, small mammals and hedgehogs. There was plenty of bird life too. One evening we had a talk by the hedgehog researcher and and watched as he fitted a long earred hedgehog with a radio transmitter. Life around camp was very civilised. Our Gers were very comfortable and wood burning stoves were lit on the coldest nights. Showers were taken in the afternoon/evening using sun showers. Everyone ate together in the dinning room/classroom Ger and there was certainly no risk of going hungry. Boiling water was available all day for hot drinks as well as snacks. I wouldn't hesitate to recommend this project to anyone and would love to go back for the argali round-up in the future. 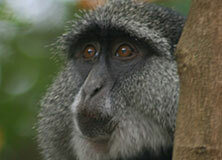 Help gather critical information to protect leopards and monkeys under threat in South Africa. How can we best help African wildlife return to and thrive in their native habitat? 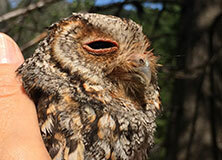 Following Forest Owls in the Western U.S.
Help researchers study the nesting behavior of Flammulated Owls in Utah and Arizona to better understand how this species is influenced by climate change.